In the same week that she did some bad dancing on her Africa tour, the prime minister announced a very bad package of new deals with African countries. The agreements will be for about £300 million (USD$386 million). 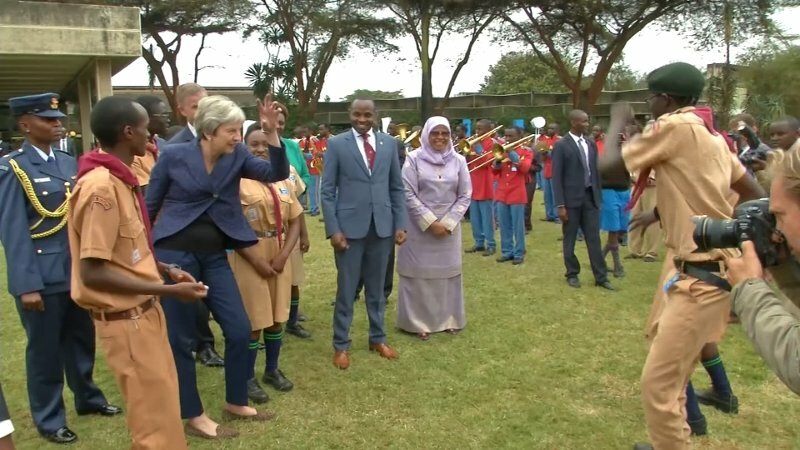 Maybe there will be no agreement on Brexit, so the prime minister is looking to Africa to grow new markets and get investment for UK companies. The agreements include a lot of money from the UK aid budget. The government says the agreements will help lift people out of poverty and help countries not need so much aid. But these agreements will do nothing to help the extreme poverty in Africa. 42 per cent of people live on less than $1.90 per day. Also, the agreements will do nothing to reduce the terrible levels of inequality in the world: the richest 42 people own more than half of the world’s population together. There is not much information, but the latest announcements look like a modern dividing up of Africa. May travelled with 29 important business people from UK industry when she visited the three biggest export markets in Africa. She said that we must use aid to help the UK. May wants to make it easier for private companies to take wealth from people across Africa. She said in Cape Town on Tuesday, where she talked about plans to use the development budget to support private industry. The following day in Nairobi she talked about how she wants the UK’s future relationship with African countries to be more about private investment and business. This is like when the UK had an empire and will not help change the causes of poverty or inequality. It is not enough to say that foreign investment will create jobs and then lead to economic growth and human development. This is based on an old idea that has been proved wrong – that investment at the top helps people at the bottom. We already know (from a recent International Development Committee inquiry) that the UK government’s economic development plan does not reduce poverty. And that is because their plans for international development do nothing to help the causes of poverty, or the biggest challenges in Africa. They need to do something about the power balance in the global economy and unequal trading relationships. Because of this, billions of pounds from foreign investments are taken from poor countries every year. If the UK government really wanted to end poverty, they would stop the illegal flow of money, close UK tax havens and end to global tax avoidance; all this would stop governments in the Global South getting billions of pounds every year. The Tory party have a bad economic model in the UK – poverty has increased – and how they want to spend a lot of money to export the same model to other countries. This is a very bad use of the UK’s aid budget. A Labour government would change the UK’s aid programme to make sure that they spend public money on real efforts to both reduce poverty and inequality. We would spend aid in solidarity with countries overseas to ensure that aid and investments work to benefit many people. We would increase investment in good public services, stop tax avoidance and work to build a much fairer world. This page was last edited on 16 September 2018, at 16:57.